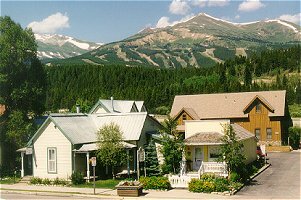 Experience the best of Breckenridge while staying at one of our three Inns located on our river property in the historic district. For Victorian charm, we offer the meticulously restored and antique filled 1885 Williams House and exceptionally private 1880 Willoughby Cottage as featured on Travel Channels "Romantic Inns of America". The newly built timber-framed Barn Above the River is decorated country style and nestled on the willow-lined river bank offering spectacular mountain and river views. Our eleven guest rooms with private baths were especially designed for comfort and romance. A scrumptious breakfast is served every morning and complimentary beverages and afternoon refreshments are available. Outdoor spa. Some room amenities include fireplaces, whirlpool tubs for two, oversized showers, mountain views, cable television, VCR/stereo, balcony/patio and more. Bed and Breakfasts on North Main Street is for non- smokers and located within walking distance to all that town has to offer. This and other Breckenridge Bed and Breakfast Inns can be found here in The Register. Romantic Country Inns, Getaways and B&Bs offer a great Colorado lodging alternative to big hotels.